How are you educating your leaders about the “T” in LGBT? Do they know how to respond to workplace questions and situations related to transgender employees or customers? Are leaders and employees creating an inclusive environment? Not sure? Well, we have a cutting-edge solution for you… Understanding the “T” in LGBT: Gender Identity & Gender Expression. 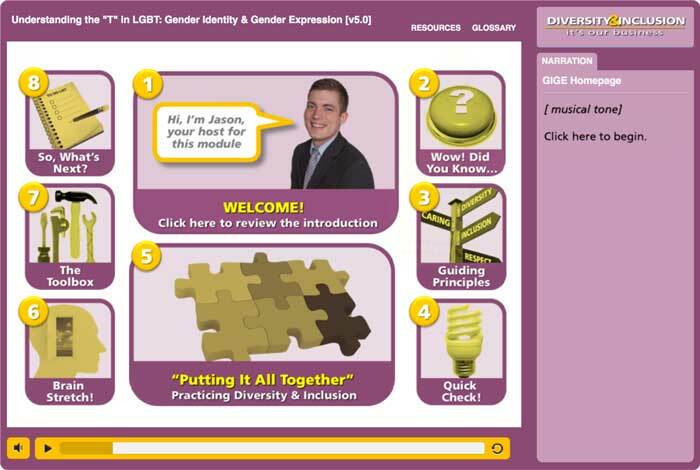 This self-paced, guided, online learning experience engages employees in critical thinking and skill-building about the trans community in a straight-forward and respectful way. Learners will explore the most important terms and concepts and gain answers to the most common questions related to gender identity and gender expression. They will identify inclusive and respectful behaviors as well as some non-respectful words and behaviors to avoid. And, they will gain knowledge and tools for addressing workplace situations related to gender identity and gender expression. “With the Employment Non-Discrimination Act (ENDA) still not institutionalized as law, this online training module seeks to provide a point of entry for education about transgender issues for those who may not have met trans people or know about transgender issues. Above: Sample page from Understanding the “T” in LGBT: Gender Identity and Gender Expression online module. Click HERE to preview Understanding the “T” in LGBT: Gender Identity & Gender Expression! 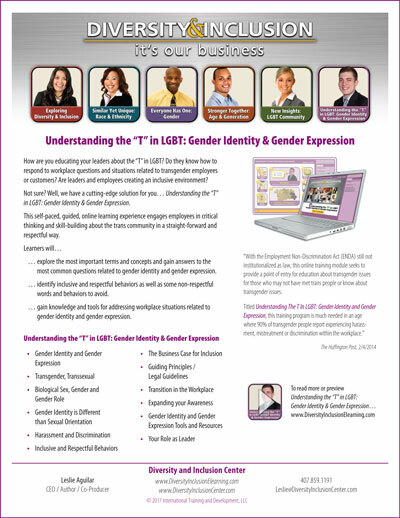 Click HERE for our Understanding the “T” in LGBT: Gender Identity and Gender Expression flyer. 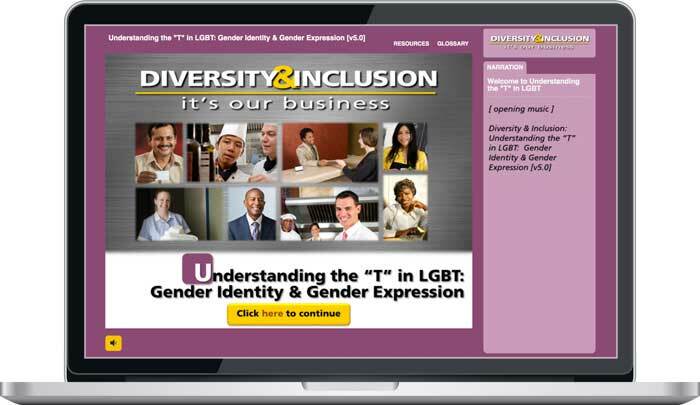 Follow Diversity & Inclusion Center’s news about our Understanding the “T” in LGBT: Gender Identity & Gender Expression eLearning module! 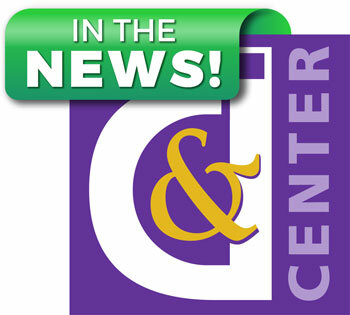 Understanding the “T” in LGBT: Gender Identity & Gender Expression eLearning module has been approved for Cultural Competence Continuing Education [CCCE] training for healthcare providers by The Oregon Health Authority. "Diversity is you're invited to the dance … inclusion means someone comes up and asks you to actually dance." Join Dr. Steve Yacovelli as he talks with Out In The Vineyard Radio (KSVY Sonoma 91.3FM) | www.outinthevineyard.com) about our Diversity & Inclusion: It's Our Business eLearning Series, with highlights about our New Insights: LGBT Community and Understanding the “T” in LGBT: Gender Identity & Gender Expression modules. 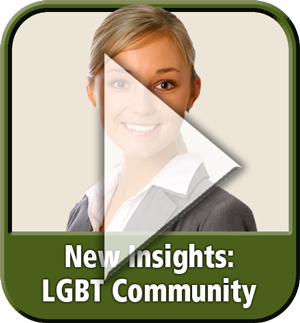 Click above to preview New Insights: LGBT Community! 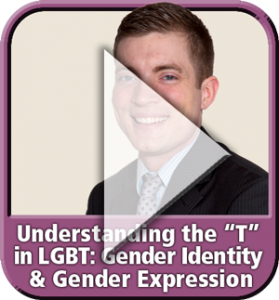 Click above to preview Understanding the “T” in LGBT: Gender Identity & Gender Expression! 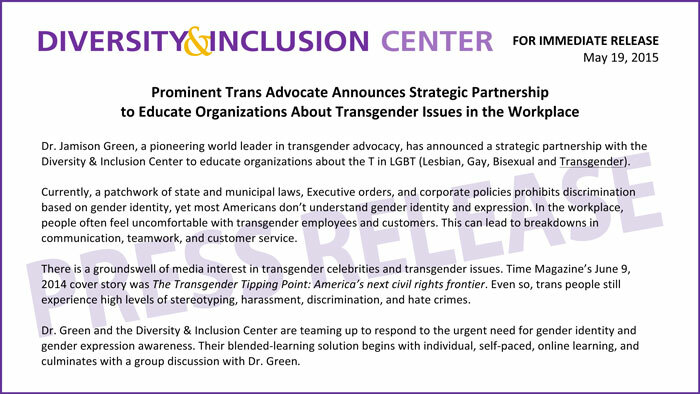 "… this training program is much needed in an age where 90 percent of transgender people report experiencing harassment, mistreatment or discrimination within the workplace." Click HERE for PDF download of the full article. “My most basic belief about the workplace and society is that people should be safe and treated with dignity; I know this doesn’t always happen for individuals who express their gender differently than others,” co-creator Leslie Aguilar told The Huffington Post. Click above to download the Huffington Post article! "All of us need to spread our understanding of all facets of the LGBT community to others to gain greater knowledge on our community as a whole and reduce misconceptions." 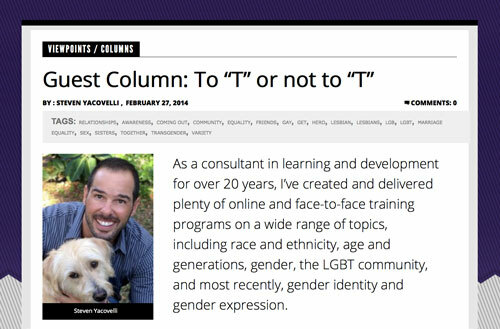 Read Steve's insightful guest column about 'T' and LGBTA in Watermarkonline.com HERE. Click HERE for PDF download of the full article. Click above to download Steve's Watermark Online article! "Nobody likes to feel ignorant. Asking questions about gender identity when you don’t know much about it can be really uncomfortable. This training approach eases that fear and increases understanding." Click HERE for PDF download of the full press release. Click above to download the full press release.